Wash your windows with a fresh cleaning method that has met the demands of over 94% of our clients in Balham! A: The pros will rinse your casements with proven water-fed pole gear or use sturdy ropes and cherry pickers to clean high buildings. We also offer interior window cleaning in Balham, done with the usual ladders and squeegees. A: This handy allows the Balham window cleaners to polish any skylight, sash window, French door, and other pane types on any four-storey building. Q: Why don't you absorb the remaining water once your work is done? A: It's simple – we won't wash your windows with regular tap water. Instead, the experts will remove the grime build-ups with filtrated water that won't tarnish your panes once it vaporises. Q: Do I need to prepare beforehand for the Balham window cleaners' arrival? A: You'll need to book an empty parking space within 30 metres from your home or office and on the same side of your street. You'll also need to provide the cleaners with complete access to your property. A: We will gladly treat any four-storey or multistorey commercial property. We can also supply you with other maintenance choices, such as gutter cleaning and pressure washing. With window cleaning in Balham, you'll give your panes the expert wash they deserve... at personalised price rates that won't exceed your budget! Don't believe us? Chase away your doubts by taking a look at our price table below. We've designed our window cleaning in Balham with versatility in mind. As a result, our service is now regularly hired by commercial and residential customers alike. Let's review our window cleaning alternatives on offer. With our outside cleaning, you can effortlessly polish the casements of any building with four or less storeys. The seasoned technicians will appear in a cleaning van. The window cleaners in Balham will then link a intuitive water-fed pole to the van's water container. The special refined water will be released through a brush-head installment at the pole's end under high pressure. When the liquid vanishes under the sun, your windows will stay spotless for weeks to come. For buildings above the fourth floor, we'll send experienced climbers for rope access window washing. Using proven ropes, cherry pickers, and ladders, they will evaluate and refresh any lofty commercial property in a matter of hours. Should you request risk appraisal reports, we'll readily provide them for you. We also take our tasks to heart and will adhere to all safety regulations. If your panes are soiled on the inside as well, the experts can carry out internal cleaning with ladders and squeegees. 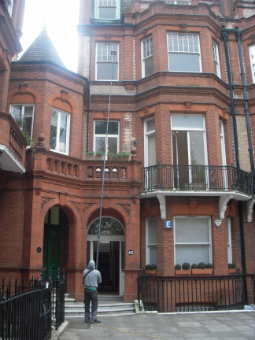 We are delighted to announce that our window cleaning in Balham has been booked by several adjacent districts as well. You can learn which locations we operate in below. Another quick and easy way to get a free instant quote or to book window cleaning services Balham SW11 is through our web site.